On Monday 2nd May, Afeni Shakur, political activist and mother of the late rapper Tupac Shakur, passed away. I was fortunate enough to meet Afeni Shakur had the pleasure of meeting her and witnessed a true Queen at work when in 2004 I worked as a producer for an international broadcaster producing radio programmes about and for an African audience. Today we take it for granted that we communicate instantly via email, mobile and social media. Whilst some of these methods of communication were available then, it wasn’t always our primary method of communication. The programme I worked on had a lot of listener interaction, mostly through letters. We received a letter from one of our listeners in Nigeria, Patrick, who was so touched by Tupac’s song “Mama” dedicated to his mother, Afeni Shakur. Patrick wanted to know more about the man behind the music and the woman Tupac wrote this song about. Ordinarily we would have just contacted Afeni’s publicity agent and perhaps received a written response to Patrick’s letter. But, as luck would have it Ms Afeni was in the UK on a promotional tour of a documentary about Tupac. As part of the promotional tour, Ms Afeni was being interviewed by another section of our company for a television programme titled “Tupac Shakur: The First Martyr of Hip Hop”. I contacted the programme enquiring whether it would be possible to interview Ms Afeni after they had finished their interview. The response from my colleague was less than helpful, suggesting that a radio programme for an African audience would perhaps not be high on her agenda, as she had a full schedule of meetings already. I pressed my colleague to at least put forward my request to Ms Afeni and as she was many miles from my studio, I would be happy interview her over the telephone. To my delight Ms Afeni agreed to the interview and insisted that she would travel to the studio where I was working to record the interview. When she arrived I immediately felt at ease with her. She was warm and very accommodating and the conversation flowed. It was as if we had known each other for a long time. My colleague Ify Mkparu, and I did the interview with her and she was very honest and open about her relationship with Tupac. I thanked her for coming and said how grateful I was that she could spare the time to fit in the interview. Her response was that as soon as she knew it was for an African audience there was no doubt in her mind that she would make every effort to be interviewed. She felt that if her son’s music touched someone in Africa enough for them to write in to our programme the least she could do was to agree to be interviewed. I could not believe how humble she was. All this against the background of her publicity team (understandably) trying to get her to scheduled appointments in a very tight programme. 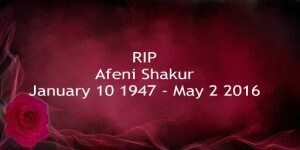 Afeni Shakur the ancestors have called you too early but AfricanPostmark salutes you as true daughter of Africa.